And as you might have guessed, the discs on which the spikes rest also make a big difference. 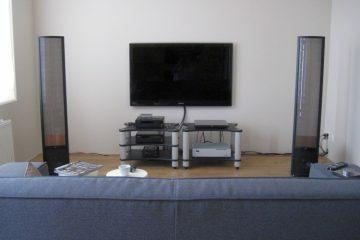 Above: The second setup as it is now – for now… Devialet 120 and Refurbished Apogee Duetta Signature magnetostatics. The other components vary. As always to be continued! Recently I bought a tall Solid Tech Radius rack, of which I made 2 smaller racks for the second audio setup. I fitted standard spikes and used the spike discs that were delivered with the Finite Elemente Spider racks that I used to have years ago. Prior to the Solid Tech racks I used a heavy home made wood table in the second audio setup. 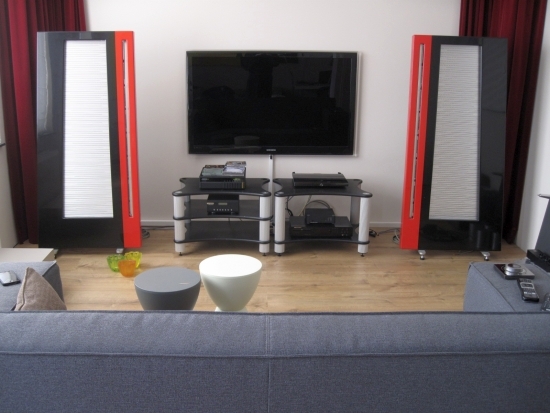 After substituting the table with the Radius racks however, I couldn’t get into the sound as much anymore and after a comparison with the old table it was evident that the two support systems were very much apart in terms of their attribution to the sound. While the home made table made for a smooth, relaxed, unforced sound, the Radius racks seemed to emphasize transients in the upper bass and make the midrange and lower treble forward, which might be a good thing if you’re trying to enhance perceived resolution or liven up a slow sounding system, but my system was already sounding very very open and the addition of these racks was just a bit too much for my taste. 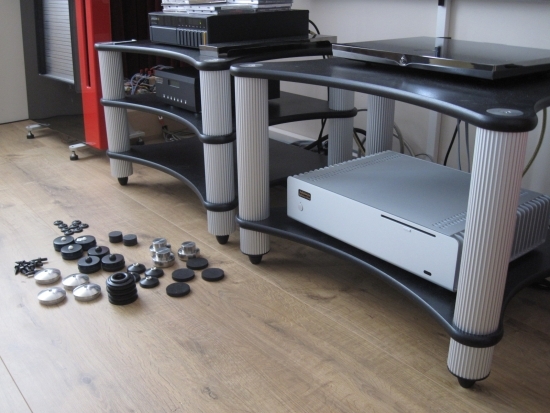 After reaching this conclusion I was ready to sell the racks again, but then it dawned on me that I had various Artesania Decoupling Discs that came along with the Artesania Turntable Platforms, that I had not yet listened to, as well as a host of other feet that I could try. A little experimentation couldn’t hurt, I figured. Above: This is how I started, using standard spikes and Finite Elemente discs, and these turned out to be the main culprit. How forgetful the mind is, or at least my mind! 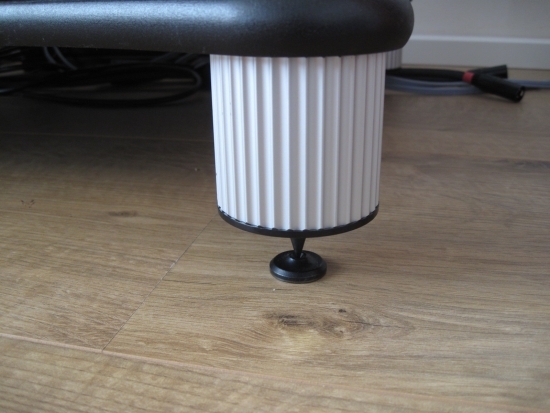 I had forgotten about the experiments done with the Apogee Diva speakers’ footers, in which it was clear that SoundCare Super Spikes eclipsed the standard spikes with standard discs, sounding less agressive and more fluid. Turns out the same was true for the Solid Tech racks. After substituting the Finite discs for the most affordable Artesania Improved Decoupling Discs I could not believe the big difference, and only then I remembered the above. Above: Is your system having harsh treble or an overall too clinical sound? 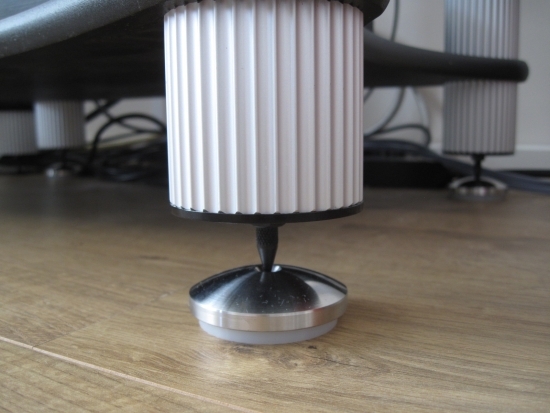 Artesania Improved Decoupling Discs come to the rescue! 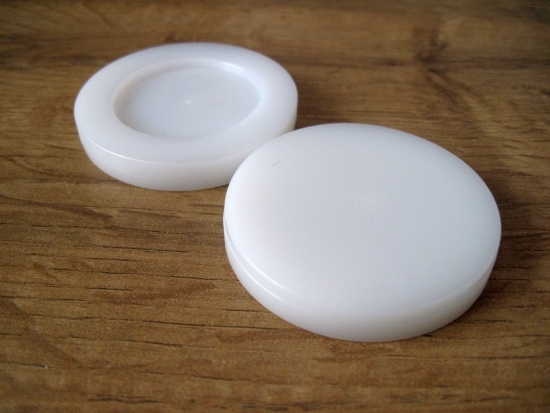 The Artesania Improved Decoupling Discs are made from some sort of plastic, likely Nylon. The bottom is covered with felt and on top is a steel insert into which the spike rests. Nothing special or so it seems. The audible difference to the standard spike discs however couldn’t be larger! 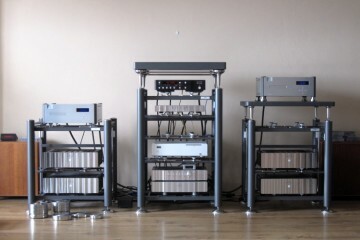 I know that some of you will call me crazy for claiming audible differences between spike bases under an audiorack that houses nothing but a music server and an amplifier, but hand-on-heart I think that anyone who calls him or herself an audiophile could hear the difference – it is simply that obvious. 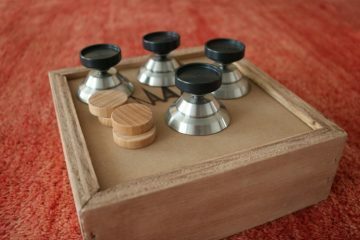 Substituting the standard Discs for the Artesania Improved Discs made the sound a lot smoother and more relaxed. Bass was fatter and treble much sweeter. Even with badly recorded albums with harsh treble one could now relax into the music. The difference really was stunning. But it was a little too much, and the sound now tilted to the other side: too smooth. 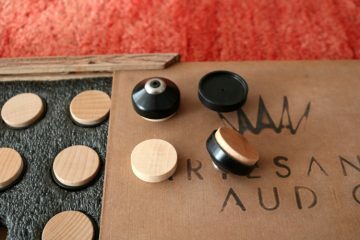 Bass transients had lost some of their power and snap, and I was missing some aspects of the articulate sound that was before. But after hearing this there was no way that I was going back to standard spike discs! 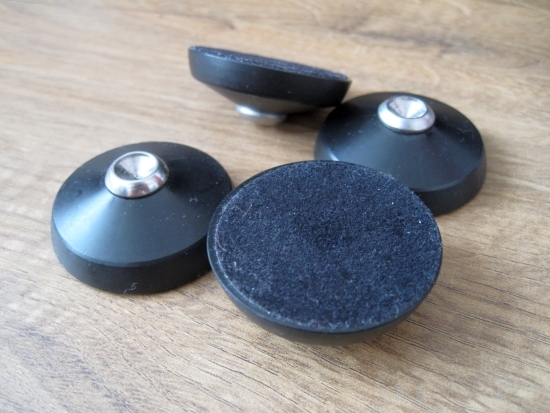 Above: Artesania Prestige Decoupling Discs with Neoprene (rubbery) damping discs. 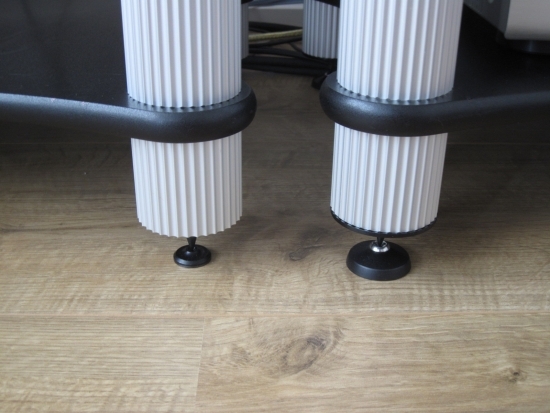 The metal discs can also be fitted with white Nylon damping discs. Upping the game using the next level up Decoupling Discs from Artesania, the Prestige Decoupling Discs, made for an interesting alternative. Less extremely smooth and relaxed, now with a more articulate midrange and faster bass transients and an overall better balanced sound. 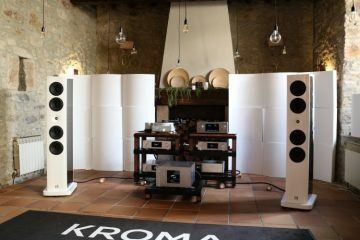 On many aspects this is an audiophile step up from the Improved discs, even if the latter are somehow still seductive and could well be the answer to prayers in systems that verge on the clinical side. Still, the rubbery Neoprene discs however make for an interesting experience: open, neutral and articulate in the midrange and treble; slower, thicker and fatter in the bass. Overall they may not be attributing to the neutrality of the sound but they sure were likeable. In spite of better articulation and perceived low level detailing, this combination does not however offer the coherence and sense of one-ness of the Improved Discs. It’s as if I can hear the effects of both the metal and the neoprene, and they’re not gelling 100%. The material for these white discs is not specified, but they look very much like the Nylon damping columns used in the Exoteryc racks, so I’ll assume the discs are Nylon, too. 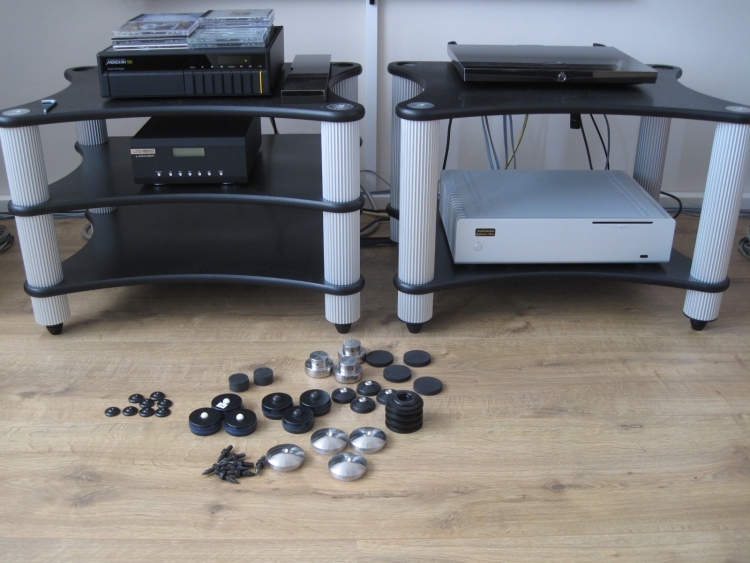 These white discs are supplied together with the aforementioned black Neoprene discs, as Artesania thoughtfully tries to cater to various listening room circumstances. 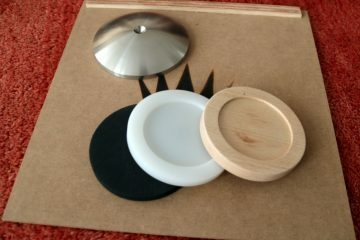 Above: Artesania Prestige Decoupling Discs with white plastic (Nylon?) 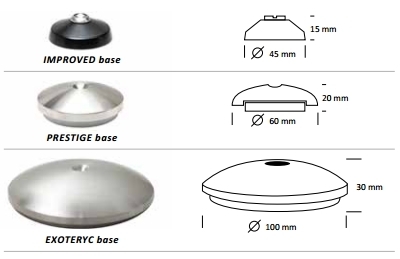 damping discs. 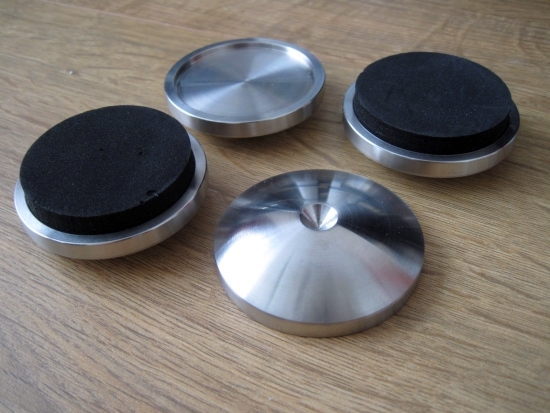 The metal discs can also be fitted with black Neoprene damping discs. Where the spikes bases above all still worked with standard spikes, Ceraballs replace the pointy spike with a Ceramic ball captured in a cavity between two aluminium shapes, hence the name Cera-ball. Previous experience with Ceraballs was only in the context of the use on Spider racks or directly between tables and components, never under a rack. Somehow Ceraballs always manage to combine the good aspects of spikes (transient sharpness and speed) without the lesser aspects (lack of body/bloom), while sounding less piercing in the treble. The result when used under the Radius racks turned out to be precisely the same, and they provided just the balance in sound that I needed for this setup. I’ve been known to prefer a less accurate but more musical sound over a more accurate yet also more analytical or clinical sound, especially when using audio components that are already on the overly revealing side, and this situation is similar. 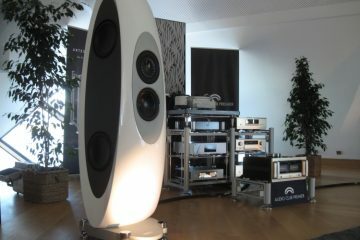 Although the audiophile in me knows that the Artesania Prestige Discs + white decoupling discs provided the most articulate and most lively sound, while remaining musical, due to the lean sounding Radius racks and the ever so revealing Duetta Signature speakers, I found that I maintained a soft spot for the super-smooth Improved Discs. But they did soften the bass and lower midrange just a little too much, and this is where the Finite Elemente Universal Ceraballs turned out to be the perfect solution. They avoid any agression or dryness, but still provide excellent speed and drive, and sound more colourful than ordinairy spikes, seemingly no matter what base you provide for them. Do please note that I am not saying that Ceraballs beat Artesania Decoupling Discs. What I hope to have illustrated is once again that it’s all about balance. I have no doubt that the Artesania Discs are perfectly synergetic with a well damped rack such as the brand’s own Exoteryc range, because that’s how I use these racks and I have never had the urge to change them for anything else. 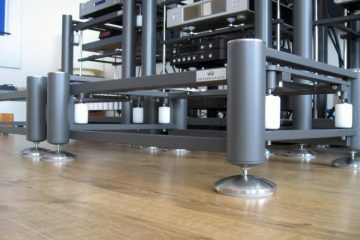 The Solid Tech Radius racks just have a very different sonic signature. The lesson to take away from this to not assume that little things make no difference… even the humble spike, and the disc they sit on are worthy of your attention!